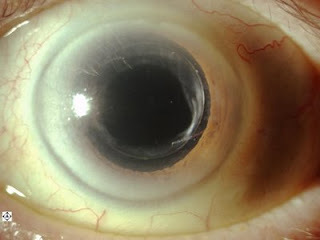 Here is a dilated eye of a gentleman who has had cataract surgery and in intraocular implant inserted in the eye. You can see the edge of the implant almost 360 degrees, the anterior edge of the natural lens capsule, and the inferior haptic that holds the lens in place. This is a very well centered and clear implant.